“House Democratic Caucus supports a well-regulated, free-market economy that is also anchored in a robust social safety net including Social Security and Medicare,” Caucus Chairman Hakeem Jeffries told reporters Wednesday when asked about Trump’s remarks. If this weren’t enough, coming from the Gray Lady herself, to send chills down the spine of Democrats, we have the liberal Democrat and former Obama administration official Cass Sunstein with an opinion piece entitled, “Trump Is Right to Warn Democrats About ‘Socialism.’” Let this title sink in for a moment, and then read his opening paragraph. By Sunstein’s own admission, most Americans who approve of (democratic) socialism have in mind Scandinavian countries, but then he feeds the right-wing machine by focusing on a definition that is meant invoke fears of Soviet style communism. At the same time, just in case we might misunderstand capitalism, he reminds us that it calls for a robust system of property rights. (Yes, ours certainly has one. One might even say that we value property over people, you know, if one were just a tad cynical.) Sunstein’s cut to the chase reminder of his commitment to capitalism recalls the words of Nancy Pelosi, “I have to say, we’re capitalists, that’s just the way it is,” in response to an NYU student who asked her about the need for the party to move left. For Sunstein, Sanders isn’t talking about socialism (someone should tell Bernie), but FDR-style programs, so why bother with the term socialism. It will just create a target for the defenders of capitalism. Sunstein has supported this program, although his language in this piece doesn’t suggest a ringing endorsement. Of course the issue isn’t only about supporting these ideas, but understanding how they have been thwarted and how they may realized. For Sunstein, we must not call the program socialism, because doing so will prevent good things from happening. One small problem. It’s been 75 years since FDR gave that speech, and how many of these goals have actually been achieved? Right to Adequate Medical Care No, not even after the ACA. Right to a Good Education No, but you can still buy one. Protection Against Fears of Old Age The nursing home crisis. Sickness, Accident and Unemployment Dream on…..
Freedom from Monopolies No way! Right to Earn Enough (for basics) Uh, no! Right to a Remunerative Job Good Luck. Looks like “compassionate capitalism” hasn’t worked out so well for this agenda. A few genuine improvements—for example, Medicare and Medicaid, but both are now more than 50 years old—a few band aids, no doubt, but 75 years? 75 years! Snails run faster. What could be the problem? Although we must not minimize intransigent Republicans and their financial supporters, perhaps some of the problems are closer to home, especially for Democrats during the last three decades, you know, since “centrism” became a thing. Maybe one of the reasons that we are still waiting is that there hasn’t been enough daylight between Democratic Party leaders and the Captains of Capitalism. 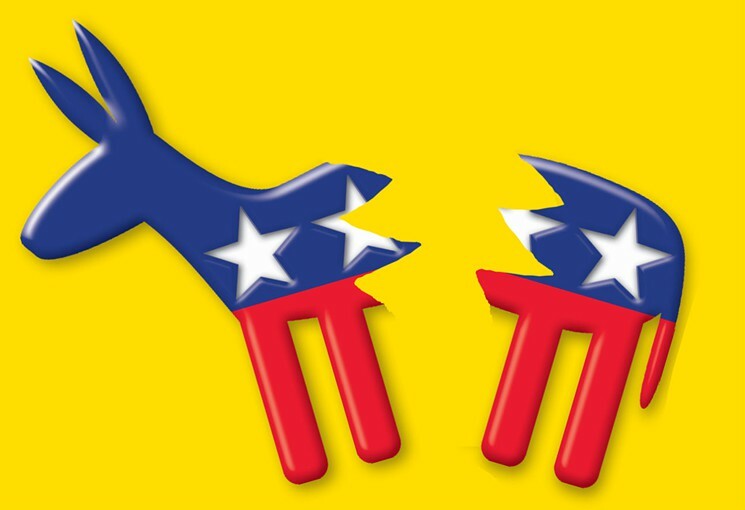 The Democratic Establishment has remained dependent on capitalist backers. ** And Dems like their lobbying jobs after working in government. Ah, self-interest. Maybe commitment to these programs over the long haul never had a chance of being as robust as Sunstein’s commitment to his beloved system of property rights, because for far too long the Democratic leadership for various reasons hasn’t been into rocking the economic boat. Among Americans ages 18 to 29, the Gallup poll found, 51 percent were positive about socialism while 45 percent viewed capitalism favorably. Gallup noted there was a marked, 12-point decline in younger adults views on capitalism in just two years. Maybe this time, especially after the great recession, with another recession looming in the next couple of years, what’s happening here, which might not exactly be clear,*** is that establishment Democrats are terrified that democratic socialism will catch on, because people want the kinds of programs listed above, and they are learning that contemporary capitalist concentrations of wealth and power make such programs extraordinarily difficult to enact. Capitalism in its present form is a serious problem in this regard, and calling for a compassionate version does nothing to disrupt the basic power dynamics of the system. And maybe Trump will prove helpful here. I mean, really, do most Americans believe anything that the man says? If he says, day, most of us know that it’s night. Trump may be the best thing socialism has had going for it in America in a long time. If he says (democratic) socialism is bad, odds are that it’s a winner. Establishment Democrats might want to factor this into their political calculations. * With apologies to the Talking Heads. ***With apologies to Buffalo Springfield.